Overall Dimension 20 x 15 x 4-1/2 in. The PuLL ELbow ™ is a time and money saving tool for anyone who installs cable for voice, data, fiber optic networks, video, alarms, paging systems, access control, CATV, music, property or energy management systems. The patented PULL ELBOW™ cabling tool allows you to pull cable around corners as easily as pulling through conduit. This re-usable tool has no moving parts to cut or pinch the cables. It mounts in seconds when pulling cables , and allows you to keep the cables at ceiling level during the pull. 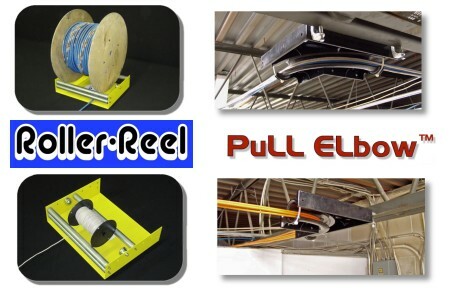 This entry was posted in Newsletter, Tools and tagged Adjustable, Pull Elbow, Roller Reel, Wire Pulling. Bookmark the permalink.